My family and I went apple picking this past week. One of our Fall traditions that we love to do (but don’t always do) is to go apple picking and make apple butter in our slow cooker. It is easy, makes the house smell wonderful and has NO sugar! Some of the links in this post are affiliate links, meaning, at no additional cost to you, I may earn a small commission if you choose to make a purchase. Thank you for supporting the blog! The woman told us that we would have to drive pretty far down to get to the apples since there were so many people at the orchard, and apparently the end of apple picking season. We drove to the end of the road and started walking down the long aisle of apple trees. No apples. “Mom, mom, I found one!” my oldest son cried out excitedly. Hmmm…one apple? I was starting to get nervous that maybe apple butter was not in the cards for us – or we’d just have to buy them from the market area. 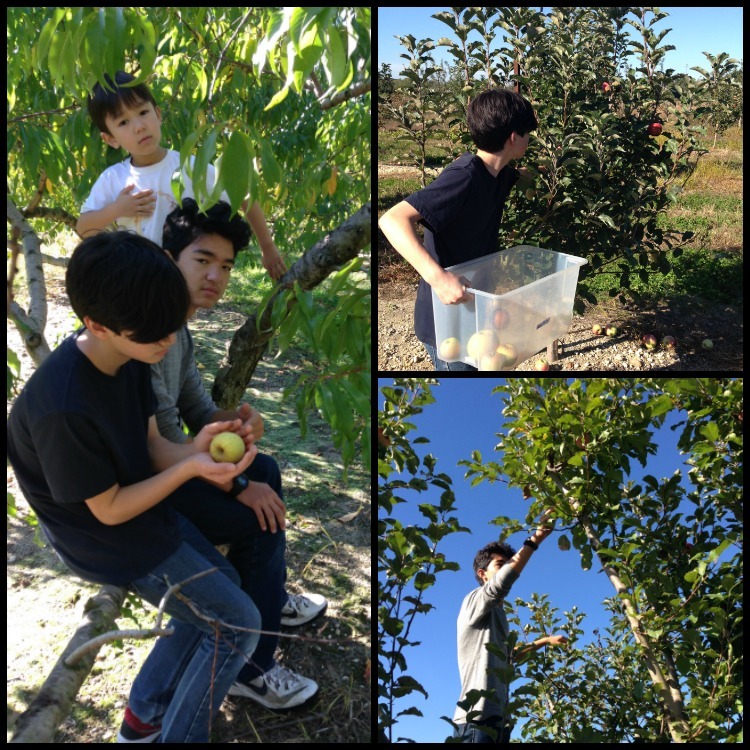 Watching them lovingly pick and cradle the single apple still on a tree was precious though! We walked up and down the row, then moved over several rows and hit the apple jackpot…sort of. We finally found the several rows of Pink Lady apples and my sons carefully checked the apples before putting it into our container. My sons were all very particular – one bruise or dark spot and they rejected it. My husband on the other hand was wandering around picking out the good apples that had fallen on the ground around the trees. By the end of the afternoon, we had 30 pounds of apples, a dozen apple cider donuts, and a gallon jug of their apple cider. We all left happy. I’ve made this in the past, and of course did not write down the recipe. Doing a quick internet search helped me remember that apple cider was the sweetener. We used Pink Lady apples and a larger red apple that my husband picked (not sure of the variety!). Yields about 6 cups of apple butter. Sprinkle the seasonings over the apple chunks. Set on low. Takes about 8 hours. When cool, ladle into jars and keep in the refrigerator! Occasionally mix until the apple chunks are soft. I have an immersion blender (like this one, which I LOVE! ), which makes this super easy. If you don’t have an immersion blender, you can use your regular blender to puree the apple mixture. If you have an immersion blender, then puree the apple mixture right in the crock pot. I had it on low for about 6 hours, pureed it, then kept the crock pot lid open and stirred occasionally for the next 2 hours until it has thickened. I ended up using the immersion blender a second time to get a really smooth consistency. My whole family loves this on toast, pancakes, and straight out of the jar! Do you go apple picking? 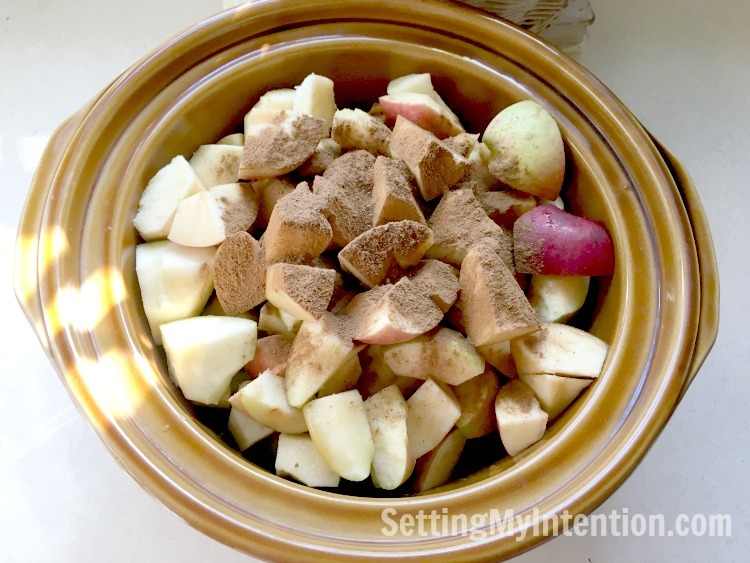 What’s your favorite way of using up your apples? This post will be shared at these awesome link-ups! Yum! 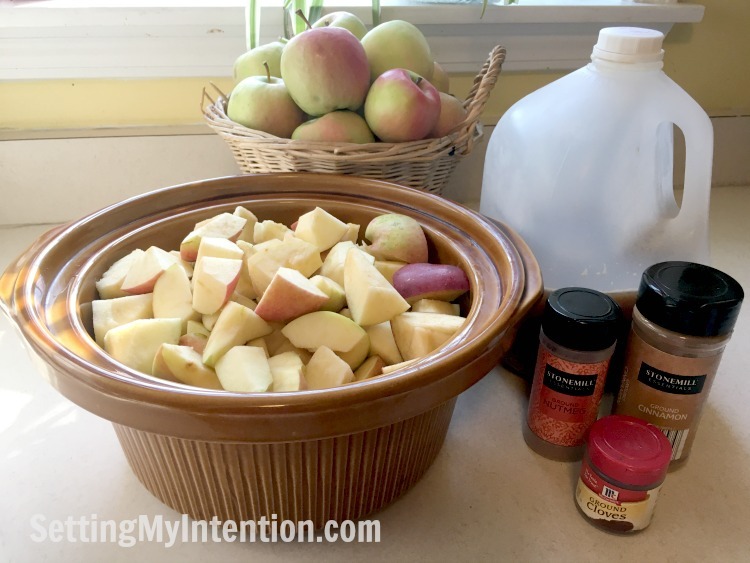 I’ve only made slow cooker apple butter a few times, but the way it made the whole house smell was well worth the cramping in my hand from peeling all the apples. I just might need to try it again! You should! No peeling required in this recipe! This looks great. Your images are so lovely. I hope you enjoy it Angela! Thank you for the recipe, it sounds great! I haven’t had apple butter in years. It’s so easy Shandy – I hope you try it and enjoy it! Thanks Jae! I agree – I love recipes that can be set and left for the day. Hi Angela! This is great! Pinning! Thanks for the invitation Lori – I’ll definitely check it out! Great recipe! I can’t wait to show my husband, he loves apple butter. Thanks for linking up to Merry Monday! Pinned & Tweeted! Have a great week! Yes! Try it Kim. Your husband will love it! I have been wanting to make apple butter for such a long time! Your welcome Jennifer! Thanks for reading and commenting. We have not gone Apple picking but I had it on my fall bucks list to do. This Apple butter looks fabulous. Thanks for sharing a no sugar holiday recipe with us at Small Victories Sunday linkup, pinned to our linkup board. Picking apples is fun! It is a lot of work though.So just last week I made pumpkin butter for the first time and I have been looking for a good apple butter recipe now and Voila! Thanks for sharing this at the #happynowlinkup. I saw that Jen! I just tried a pumpkin butter recipe too. The family definitely likes apple butter better, but I’m enjoying the Fall taste of pumpkin butter. Lovely! I plan on making pear butter this weekend! Ooh, pear butter. I guess you can turn anything into a fruit butter. Sounds delicious! Oh no! That sounds like your apple picking adventure was definitely off to a worrisome start. 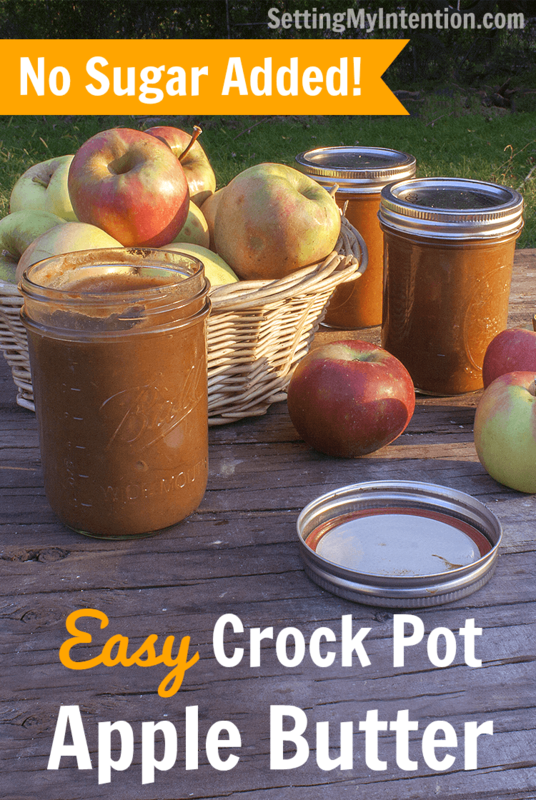 I’ve only had apple butter a few times, but this recipe sounds delicious. And I love that it has no extra sugar added. Thanks for sharing at the #happynowlinkup! Thanks Leslie. Yes – I love the fact that this has no extra sugar, especially after Halloween and all the extra sugar that’s added to our household!